What symptom do you have? We offer services including Shiatsu, acupuncture, counseling and treatment for both the body and mind that improves the mental state, as part of a unique form of medicine called Kansei Medicine which promotes the natural healing powers of the body. Many of our patterns, with physical of mental pain, show steady improvement daily. When you come to Tokyo and Kanagawa, please come and see us. Professionals trained thoroughly in Japan will look after you. 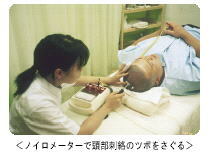 Onnetsu therapy is a far infrared heat treatment. This heat strengthens the Automatic Nervous System that controls all body function. If you abstain from eating during a short period (1 to 3 days) or have a small bit of natural food, what will happen to your body? What symtom do you have? headache, menstruation pain , etc. Symptoms for computer symptoms of eyes, neck, shoulder, arms, fingers from the long time working of computer. Allergy atopick skin allergy , hay fever , athma , rhinitis , etc. Phisycal & mental relaxion Autonomic nervous system can be balanced by our treatment. disease from autonomic unbalance like nervous fatigue, insomnia , stomach ulcer , etc. Stress Fatigue , no energy , mental tension of stress are signal of the disease. One of the most important characters of oriental medicine can be protected before making serious disease. symptoms by sport joint , tendon , muscle problems. tennis elbow , sprain etc. Treatment of dancer’s symptoms is our specialty. improvement of body constitution and health , ageless Regular treatment make your body constitution improve. Better guality of life can be gotten. For persons which have chronic disease, allergy, on busy work our therapy is effective and for ageless it is useful. Please consult us for any disease or complaints.